When customers initiate their pursuit of a new vehicle, they’re probably envisioning themselves cruising around town in a stylish sports car or a hulking SUV. These individuals tend to ignore smaller compact vehicles, as they often assume that the smaller stature leads to a reduced driving experience. Fortunately, there’s a perfectly logical target for those seeking an inexpensive small sedan. The 2018 Chevy Sonic provides all of the amenities and capabilities that a driver would generally expect from a much large, pricier vehicle. The nameplate’s incredible performance specs (and impressive efficiency numbers), safety technologies, entertainment technologies, and cargo space makes the model a must-pursue, regardless of how you feel about compact cars. For a compact vehicle, the 2018 Sonic’s pair of available engine offerings are surprisingly impressive. Both units provide the predictable efficiency specs, but they also manage to promise a whole lot of power. The 1.4-liter ECOTEC Turbo engine is the smallest of the two offerings, but the system still manages to deliver a respectable 138 horsepower and 148 pound-feet of torque. Meanwhile, thanks to an array of clever fuel-saving technologies, drivers can also anticipate a practically-unmatched 35-mile-per-gallon highway fuel efficiency, allowing drivers to save even more money at the gas pump. Alternatively, drivers can opt for the impressive 1.8-liter ECOTEC four-cylinder engine, which cranks out a respectable 138 horsepower and 125 pound-feet of torque. This offering is also incredibly fuel efficient, promising drivers up to 34 miles per gallon on the highway. Accompanied by a six-speed manual transmission, owners can truly anticipate one of the best driving experiences in the class. Since you’re going to be operating a smaller vehicle, you’ll surely want the ride to be equipped with a number of reliable safety functions. 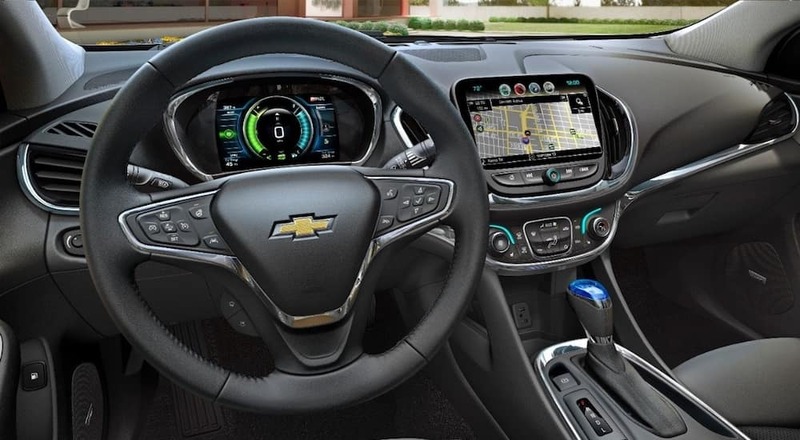 Fortunately, the 2018 Chevy Sonic more than delivers, as the vehicle includes a number of notable features that will assure safety and security. Many of these functions are intended to prevent accidents from occurring altogether. These features include the clever Forward Collision Alert, which will notify the driver when a crash is imminent. Meanwhile, the Lane Departure Warning will provide the driver with an extra set of eyes, which can be especially useful when traveling on the highway. Even the rear vision camera and Rear Park Assist technology are notable, as they’ll prevent a driver from finding themselves in a fender bender. In the event of a crash, drivers can also turn to the array of protective safety functions included in the vehicle. Primarily, the 10 standard airbags and the high-strength steel safety cage should play a significant role in keeping occupants completely safe and secure. If help is needed, drivers can also turn to the OnStar Automatic Crash Response System, which will subsequently connect them with an OnStar Advisor. This individual can send emergency personnel to the site of the crash, assuring that help is right around the corner. Chevy has also been focused on providing their drivers with the best possible driving experience, and that sentiment certainly applies to the 2018 Chevy Sonic. After all, the vehicle includes a number of technological amenities that will positively influence any commute or road trip. It starts with the brand’s MyLink system, which allows drivers to access a host of applications via the accompanying touch-screen unit. Plus, thanks to the Apple CarPlay and Android Auto compatibility, drivers can also connect their smartphone, allowing them to make phone calls or listen to their favorite playlists without compromising safety. Meanwhile, your passengers will surely appreciate the available 4G LTE Wi-Fi, which allows them to constantly stay on the grid. With the ability to connect up to seven devices, you can anticipate that your occupants will consistently be taking advantage of the reliable wireless internet connection. If you’re someone who tends to travel on any weekend excursions, you’ll surely need enough cargo space to accommodate all of your luggage. Well, fortunately, the 2018 Chevy Sonic comes through again. If customers opt for the hatchback variation of the nameplate, they can capitalize on the 47.7-cubic-feet of cargo space, allowing them to fit whatever equipment they see fit. Plus, thanks to the 60/40 split-folding seats, drivers won’t have any issues maneuvering their interior to help make the loading process a whole lot easier. Of course, the sedan version of the Sonic still manages to deliver a respectable amount of room. The trunk can fit up to 14.9-cubic-feet of cargo, which proves to be more than many competitors (including the 2017 Toyota Corolla). Now that you’ve determined that the 2018 Chevy Sonic is the perfect target, it’s time to start shopping. Well, those living in the Albany, New York area have it easy, as there’s a local dealership that provides everything you could possibly need during the car-buying process. DePaula Chevy doesn’t only provide some of the best prices in the area, but they also deliver a number of notable benefits to their customers. Ultimately, if you’re looking for the optimal buying experience, there’s no chance that you can do better than DePaula Chevrolet.